From time to time, you may want to clean up your laptop’s hard drive. It’s easy to run a process that cleans unused files and fragments of data from your hard drive to free up space. Enter Disk Cleanup in Cortana’s search field and then press the Enter key on your keyboard. In the Disk Cleanup: Drive Selection dialog box that appears choose the drive you want to clean up from the drop-down list and click OK. 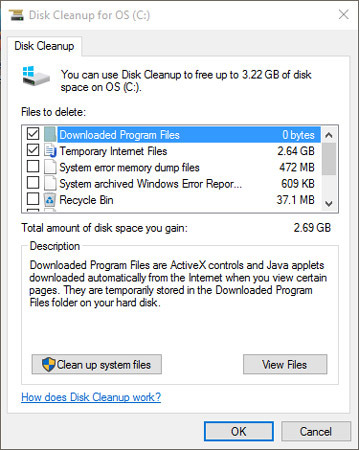 Disk Cleanup calculates how much space you will be able to free up. If your laptop only has one drive, the Disk Cleanup: Drive Selection dialog box will not appear. Your computer will go straight to calculating how much space you will be able to free up. The resulting dialog box tells you that Disk Cleanup calculated how much space can be cleared on your hard drive and displays the suggested files to delete in a list (those to be deleted have a check mark). If you want to select additional files in the list to delete, click to place a check mark next to them. After you select all the file types to delete, click OK. A message appears asking if you are sure you want to permanently delete the files. Click Delete Files to proceed. The selected files are deleted.